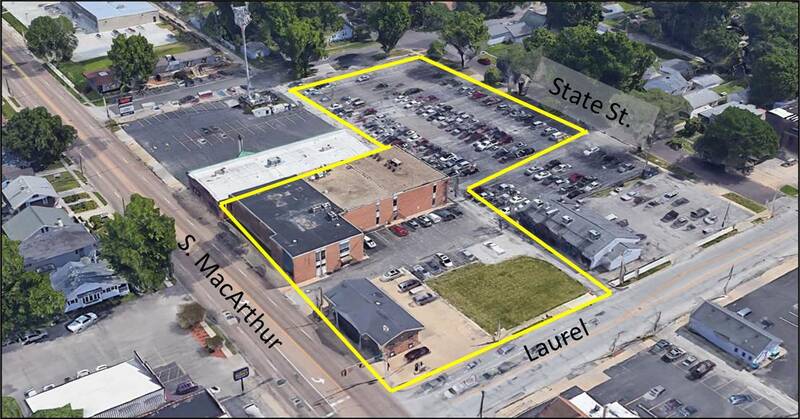 A major redevelopment project may be occurring soon on MacArthur Boulevard in Springfield, one that Ward 7 Alderman Joe McMenamin says would be along the lines of the HyVee and MacArthur Park Apartments projects in terms of investment and impact. “I think this would be in the top five redevelopment efforts I’ve seen so far during my time on the council,” McMenamin said. The property under contract, which includes the former Federated Funeral Home building and a now-vacant law office. CEHOG, LLC, an entity controlled by the Hoogland family, has a contract to purchase more than one-and-a-half acres of land at the corner of MacArthur Boulevard and Laurel Street. Curtis Tillett, a broker with The Real Estate Group, originally listed the property for sale at $750,000 in September 2017. The parcel includes a building formerly occupied by the Federated Funeral Directors as well as a vacant law office and a large parking lot along State Street. The proposed project calls for demolishing the two vacant buildings and possibly the building that currently houses Family Video, which is also owned by the Hoogland family. While the intention is for commercial development, a large open space would remain on the eastern section of the block to serve as a buffer between the new development and the existing residential homes on State Street. McMenamin said so far, the idea has been well-received. “The feedback has all been positive, mostly because Eric Hoogland’s plan involves knocking down three buildings that are beyond their useful lives.” McMenamin also said he likes the idea of getting rid of the buildings that sit along the edge of MacArthur so that it would be easier to accommodate plans to widen the road in the future. The zoning request is scheduled to be heard by the Planning and Zoning Commission on Feb. 20.